To eat healthily you need to get the right balance between different foods. For most people, a well-balanced diet is one that is low in fat, sugar and salt, and high in fibre5. Your diet should also contain enough protein and a wide range of vitamins and minerals5. It is important to remember that your body’s nutritional needs may vary depending on the type and severity of your condition. Particularly, if you are unwell and losing weight you may need to vary your diet from the recommendations below. Please refer to the 'Coping with eating difficulties' section for more advice in those circumstances. © Crown copyright Department of Health in association with the Welsh Assembly Government, the Scottish Government and the Food Standards Agency in Northern Ireland. 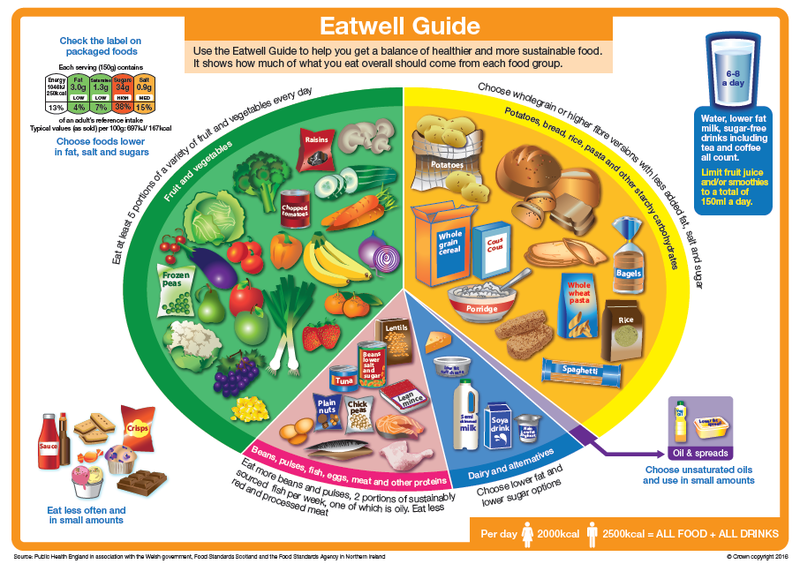 The Eatwell Guide, developed by Public Health England, shows how much of what you eat should come from each food group. This includes everything you eat and drink during the day. If you have advanced cirrhosis you may be advised to reduce your salt intake further (see ‘Cirrhosis and advanced liver disease’ section). It is important to choose a variety of foods every day to get a wide range of nutrients. However, your diet should also be designed around you and the needs of your condition. Ask to see a registered dietitian if you are not sure.